I smiled. Seeing the pasta on the tray was like greeting a friend. It was the first meal I had way back on Day 1. It’s hard to believe that I’ve eaten this much school food and lasted this long. Frankly, I thought for sure I would have been found out by now. Anyway, I love hot food. I was starving by the time I got to lunch. I loved the feeling of piping hot pasta going down my throat. It was cold outside and there’s nothing better than a hot lunch. A sandwich just can’t compete. I even squealed “Spinach!” when I opened up the plastic. It didn’t taste half bad either. Milk was a semi-accident — today I accepted it when they offered it to me so that I could look a little closer at the packaging. I may want to do a further post on milk down the line (I blogged about milk before). As usual I didn’t drink it because my lactose intolerance is severe. I gave it away to a friend. Did you ever hear about the Hart & Risley study? It documented the “link between the academic success of a child and the number of words the child’s parents spoke to the child before age three.” They found that there was a 30 million word gap by age three between the vocabularies of kids from low socio-economic backgrounds to those of kids from higher SES. Even more devastating the researchers found that it was insurmountable. What do you think about that? We’re hoping for a better night tonight. Someone did not sleep well last night. He was awake in the night screaming. It has happened two nights in a row, which coincides with him being accidently given some pretty minor wheat snacks during afternoon snack both days. When I picked him up from his crib at 11:30 am last night, he was arching, kicking his legs out, and screaming. Until going gluten-free, he was awake during the night frequently. I have read that for some kids gluten disrupts night sleep. Well, we have always had a bad sleeper (since coming home from the hospital). That was until this fall. Things that make you go hmmm. His regular caregiver was back and we all rejoiced. I chatted with her about what happened and how heartbreaking it is that my kid has to be that kid with allergies and carry that burden. I don’t want to be a “high maintenance” mom but now I’m going to have to be, for the health and well-being of my son. Don’t get me wrong, I will and do advocate for my little one, but I still mourn the fact he can’t have a normal experience. So he ate everything except for all of the eggs and the yellow peas. I mentioned before that my husband is learning to cook Indian food. He’s starting with rasams. I don’t want to discourage him, but what he is producing is insanely spicy. He tried to make something last night (after our son had gone down) and said happily, “Don’t worry, I used half the cayenne pepper.” I could barely take two sips. Anyway, to make the base he had to use the juice of a 1,000 yellow split peas. Just kidding, but he did have a ton of non-spicy split peas left over and I thought I’d toss them in our son’s lunch. My kid did not like the peas and didn’t finish them. I’d estimate he ate only half his eggs and peas. He also left half of the mandarin orange. Everything else was consumed. Someone asked about the metal lunch boxes used by Liz Snyder from ieatreal.com — they are from Planetbox. I’m interested in doing a big review of the products available for lunch packing as I go back to packing for myself. There are many options to choose from and they can be made waste-free, which some districts are requiring. My son’s lunches aren’t waste free since I use plastic wrap on them. The soup from yesterday (Imagine brand) was dairy free and came in a large paper box. I’m buying my soups from boxes now. Hopefully I can make our own soup next year! 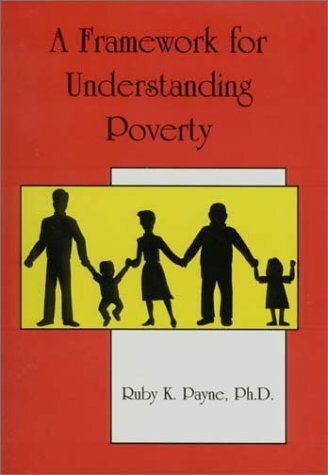 A copy of A Framework for Understanding Poverty. I had never heard of this book until a close friend of mine told me that her principal gave a copy of the book to every teacher in her school. She is a person of color and told me that she really liked this book. I figured I should read it too so I bought it. I’ve found that the book is somewhat controversial in certain circles. Some people think the author stereotypes people and others think she provides important insights into the lives of people living in poverty. I think that there is truth to both perspectives. But I think it’s an important (if not a little disorganized) work that does help the reader think about poverty in a new way. I'm so impressed you can get your son to eat all that. My daughter is 4 and eats like a bird. 3 bites and she's done! That's great that parents from higher SE groups recognize the need to communicate with their children. I know some people's first response will be to want to somehow take that away and redistribute it to those of lower SE, but you can't do that in this case! How about instead, we try to get those in the lower SE groups to model their own behavior to that of the higher SE groups? Let's be happy that those in higher SE groups are doing a good job, and NOT try to PUNISH them or their children (coughtaxescough). The whole SES= success argument… there's probably some truth to it. But, I came from an impoverished, welfare family in the midwest. My parents are not educated, ignorant, and, well, "not very smart" is a way to put it nicely. And they are still on welfare. I chose to better myself, read, get education, and now I'm a physician. From my experience, my parents didn't read to me because they really don't know how, and I would venture to guess that this is true for many lower SES families. How do we get past this one? Your blog always makes me think about my parents. It's almost funny in a tragic sort of way- I grew up on junk food, candy, no trips to the dentist or doctor… healthy lunch was the last thing we ever worried about. It's very thought provoking. I think now you can say flat out that your son has a gluten allergy and should be treated by your daycare just as a child with a peanut allergy should be. There is no reason why your daycare should be giving him food that causes him to writhe in pain. I read that same study when it came out, and I often think of it as I walk around this world, watching parents ignoring the kids they're toting around while having cell phone conversations. From the time she was born, when I'm with my daughter, I'm with my daughter –people who ignore their children are missing out on one of the best parts of parenting. I remember coming home from the hospital with a video given to us by the nurses –it basically told us to talk to our new child. I kept wondering –why do we need to be told this? How can you not talk to this brand new being that has transformed your life? There have also been studies that look at the manner in which parents in different socio-economic brackets interact with their children. Parents who are professionals will ask their children questions, to get a dialog going (even before their children can speak). Parents of children on welfare generally only spoke to give commands, and most of the comments they made to their children were negative/discipline comments. It's such a cycle too –if your parents had the money/opportunity to become professionals, then your childhood probably prepared you to move into that sphere as well. If your parents didn't, your childhood environment can cause a deficit you can never fully recover from. Hey, Mrs. Q! 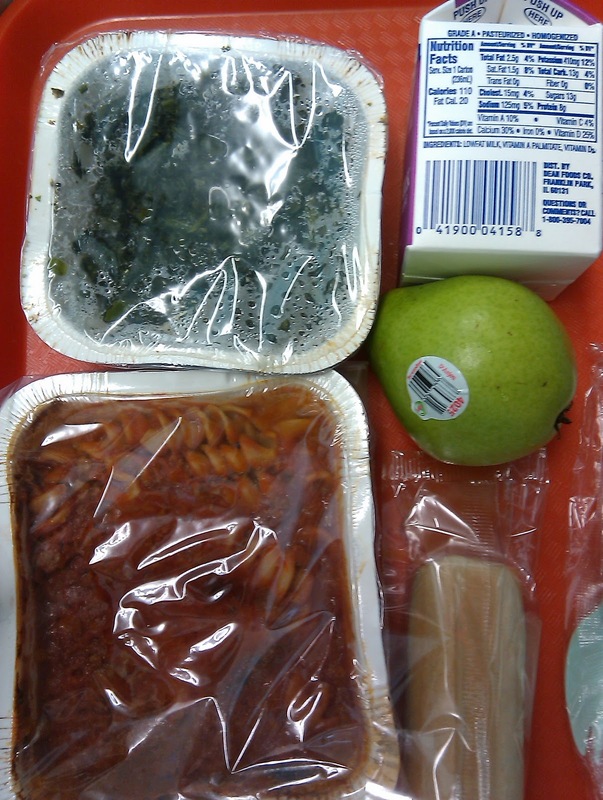 I hope it isn't too late, but how 'bout a poll of what your last school lunch will be? Pizza? Sloppy Joe? Frito Pie? How much language is used in the home also ties into how much TV is watched (obviously few people interact with other people while sitting in front of a tv or computer) and the whole summer school argument as well. Reminds me of some of the arguments made in "Outliers". Which fascinated me. The allergies has changed the way my whole family eats but it is for the better. I fell in love with the stainless steel Planetbox, but am so disappointed that it is made overseas. (Laptop Lunches makes some of their products in CA, but also outsources some.) In addition to changing my eating habits (more veg, less meat, more local) I am also trying to change my buying patterns and support US manufacturing. If/when you start doing product reviews I would be VERY interested in seeing products that are made in this country! My daughter has either a colby-jack cheesestick or a small container of cottage cheese, (my attempt at protein –she refuses to have any meat, or sandwiches, and she's allergic to peanuts and tree nuts), some crackers, some fruit (canned peaches w/out the syrup, or sliced apples), and a small dessert. She's 10, so I can't fool her into eating anything. She eats more variety at home, but she doesn't want anything messy or complicated for lunch at school (luckily she also doesn't want the hot lunch). Plus, two days a week she has a shortened lunch period because she leaves class for band practice, so she tells me to send in even less food on those days. Laurie I agree with you…I pack both my 5 1/2 y.o and my 2 y.o kids the same thing…1/2 sandwich on sprouted bread ( usually natural pb and sugar free jelly) and a peice of fruit , or a fuit cup packed in just fruit juice. They get water or a cup with milk and that's it…they have a hard time even just finishing that….I wish both of them would eat more!!!! Don't worry about being THAT mom. As a preschooler, my son had dairy, soy and peanut allergies that were all pretty severe, as well as asthma and a slew of environmental allergies. To put it into perspective, he had his own cardboard box of meds (including an epi-pen) that the poor director had to take on the bus when they went on field trips. LOL! Ugh. And yes, I always felt bad when he couldn't have the same birthday cupcakes and other treats that all the other kids had. And he was sometimes miffed too. But, you know what… it turned out to be such a positive thing. We learned about a whole other world of food. How else would I have found out there's this thing called rice cheese?! We found ways to create almost everything a "normal kid" would eat. And NOW, we're much smarter and are looking at more specific elements of his diet (ie, preservatives, etc)and the rest of the family's too. For example, isn't it a little odd that we found organic milk doesn't send him into an asthma attack like "regular" milk does? The SES study is interesting. I wonder, did they segregate results based on WHO the child's primary caregiver was? Are poor children with SAHMs spoken to more or less than kids in subsidized daycare, for example? Are the higher income kids put into fancy baby schools (daycares for high achievers)? I also wonder if they parsed out where the language was coming from – is it all words, or just those spoken by live caregivers (i.e., does watching PBS help close the gap?) Interesting. It is so hard when your child has a special food need, especially if it is a "hidden" allergy, like gluten or lactose sensitivity. My son cannot have food colorings, but it is AMAZING how many grown ups feel I'm just "too strict", "too controlling" "too mean" and give him M&Ms, etc. "to be nice". Well, giving sugar to a diabetic child isn't "nice" and neither is giving foods that make them feel bad to kids. It is a constant battle and I do think people resent it sometimes that things always have to be 'special' for one child. Whenever we go anywhere, even over to cousin's house to play, I always pack a "Robert safe" snack and include enough for all of the children to eat so I at least know he has an alternative. I wish people knew that we as parents don't purposely just make up these food issues. Coping with gluten free, Feingold, or other special diet takes SO MUCH work sometimes. Who would choose that? Back in the 80's and 90's, I rode the bus to work and the route passed thru an economically disadvantaged area. Lots of moms, especially very young ones with small kids in tow, got on in that neighborhood. I noticed that most of them didn't seem tuned in to their kids at all. In many cases, 2 such young moms would be riding together and they'd be gabbing a million miles a second about their social lives or clothes or make-up. I used to feel so sad for their kids! I just wanted to grab them and tell them to pay attention to their kids but I realized that their own parents probably hadn't given them the attention they needed and they were just passing on that legacy. I always wonder if the last generation didn't give their kids adequate attention because they had to work so many hours to support their families and that's where the breakdown occurred. I sometimes see this phenomenon with parents who are clearly not disadvantaged. Their kids are trying to tell them something and the parent just doesn't want to hear about it. I always think those are the parents who will someday wonder why their teen just won't talk to them anymore. As for the study I think it shows the patterns and cycles that can occur (but can be broken). We didn't have much growing up but our parents always read and spoke to us. Unfortunately parents may not do this if it was not done to them. As for being the allergy mom remember you are helping educate the teachers too about food and what it truly means to our bodies. wow! I have to say a sad thing! My parents are middle class and moderatly educated. But as a child in elementary school in Texas I was teased for my large vocabulary. My parents spoke to me like I was a short adult. There were some things I didn't understand but I used the terms any ways. I think my point is how we speak to our children maybe just as important as how much we say. First on the pasta/spinach: what a great combo! I have begun regularly stirring spinach into my pasta sauces for an added veggie boost on spaghetti night (super thinly-sliced onions, too. Even adding it to canned sauce makes a world of difference). 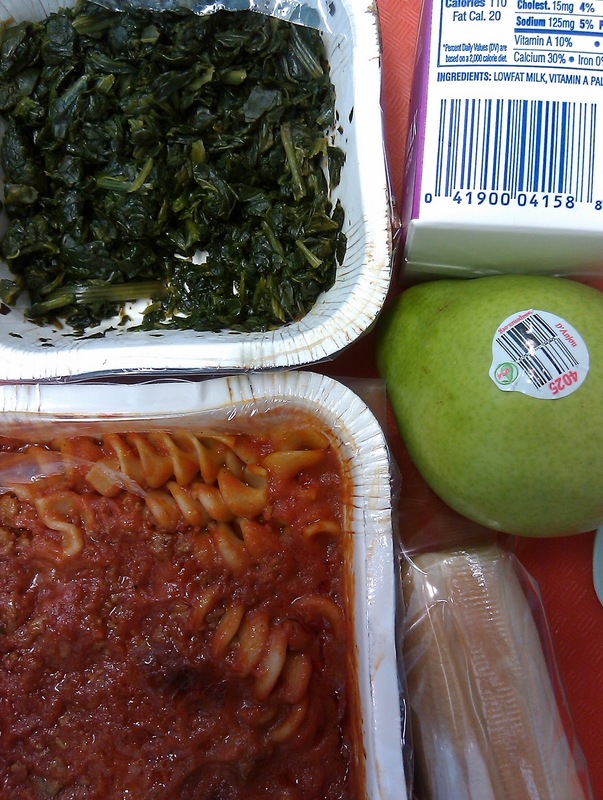 If it had been me, I probably would have dumped the tray of spinach into my tray of pasta and mixed it all together–yum! To my delight, I recently discovered on the frozen foods aisle (particularly walmart) that instead of huge frozen bricks of spinach, you can now find spinach frozen into little balls. It's SO EASY to just grab two or three spinach balls and toss them, frozen, right into a pot of sauce. 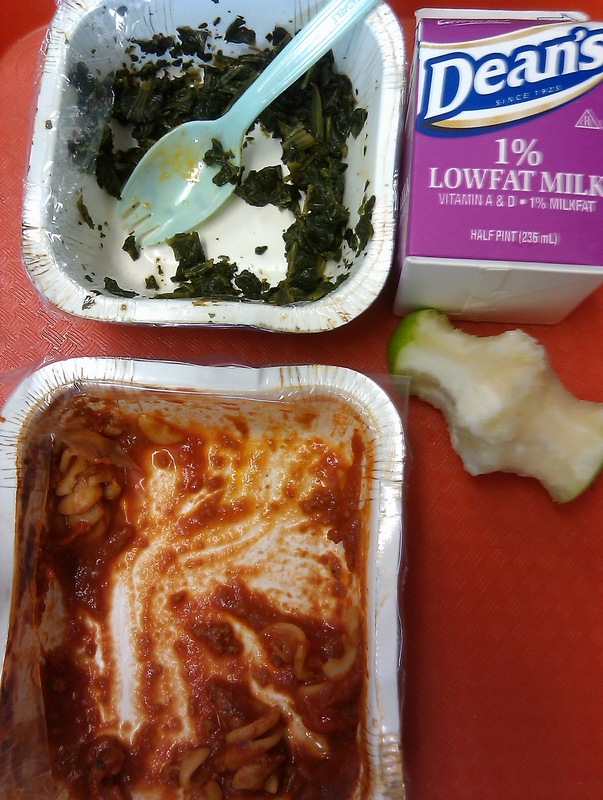 By the time your pasta's ready, the spinach has defrosted and melted right in. It's such a simple, no-fuss way to get some extra veggies into a meal. Second, it saddens me to think that parents wouldn't speak to their children regularly. It pains me enough that so many children aren't read to, but to hardly TALK to them?! How do you not converse with someone you live with? I do wonder though, instead of turning on a TV, even to PBS, what happens if you pop in recorded books for kids to sit and listen to? Not too long ago, kids grew up listening to stories on the radio. What if you popped in "The Secret Garden" or "Alice in Wonderland" for a three year old? (or even a munchkin in a playpen?) It could be an interesting experiment, especially since so many libraries now have whole sections devoted to recorded children's books. If you can grab them for free anyway, why not give it a shot? I notice that your milk was 1%. I read somewhere that not all dairy has equal amounts of lactose, reduced and fat free products having higher levels. I also heard some lactose-intolerant individuals say that they were able to consume milk which had not been homogenized. That's the type of cow's milk we usually drink. Also yogurt and kefir have lover levels of lactose than regular milk. I previously had assumed all dairy was equally lactose-containing. I used to read Biggie's lunchinabox.net blog when she was still posting, and that has so much info on bento lunches for preschoolers. 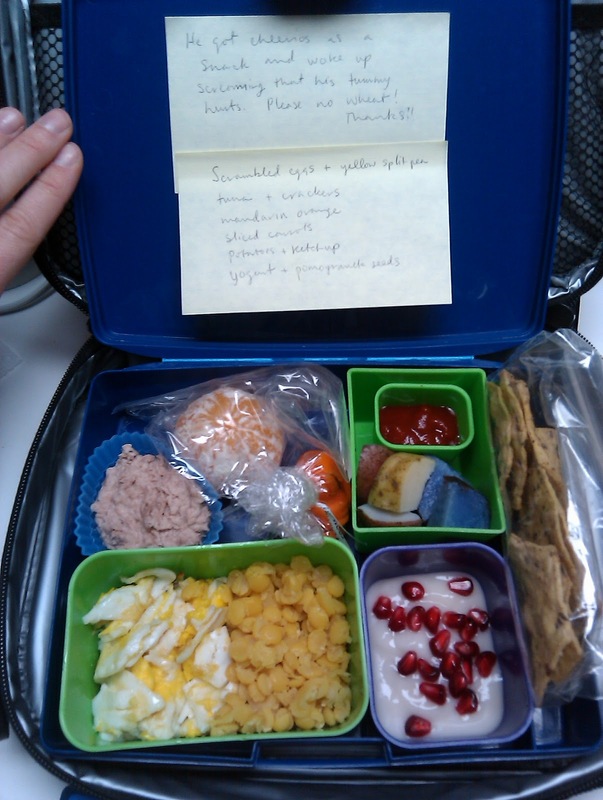 The lunches she packed for her son seemed much smaller than what you send, though. Have you looked into the caloric requirements for your son's age and what that translates to for lunch? 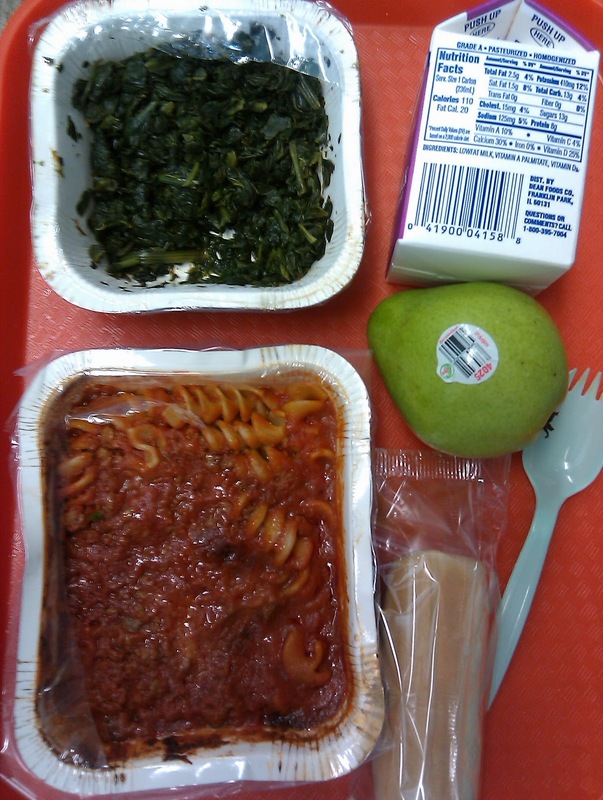 Stef – the lunches may appear big, but he's eating most of the food. I think part of it is that when I started packing for him, every day on the piece of paper I got back "I ate everything" was circled. I assumed that meant that he was hungry enough to eat everything. I didn't want him to starve so I kept stuffing it full of food. Finally I asked his caregiver most specific questions and I realized that they were just tossing his leftovers and washing the containers. When I asked them to save the food, it made it easier for me to see what he liked and tailor my meals better. My focus changed from quantity to personalization.